Sheet metal working machine manufacturer, Bystronic, has launched a new press brake that can be moved around a factory by fork lift truck. In a footprint of less than three square metres, it offers a bending capacity of 80 tonnes over 1.5m. 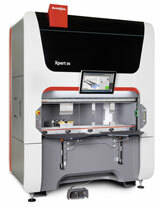 Called Xpert 80, it joins the smaller 40-tonne, one-metre Xpert 40 model that can be similarly repositioned and has proved popular since its introduction at the 2014 EuroBlech exhibition in Hannover. Both machines boost productivity by avoiding having to use a large, slower press brake to bend a small component. Output can be increased further by relocating the machines next to a laser cutting cell, another press brake or other machine tool. The new, larger press brake can bend material up to 20mm thick and is suitable for almost any task, from large volume runs to small batch, job shop production of complex parts. The machine may be equipped with multiple tools to enable all bends to be completed sequentially. ByMotion drive control, a Bystronic development, ensures that the Xpert 80’s upper beam and backgauges are accelerated with high precision. Fast bending speeds up to 25mm/s are attained. Ergonomic design features include drawers built into the side of the machine for housing bending tools and other equipment within easy reach of the operator. A height-adjustable, folding table at the front of the machine can be used as a working surface or storage area. Power consumption is low due to the machine’s energy-conserving design and the start-stop technology employed in the drive train. Upper and lower tools self-seat during clamping as the operator presses an icon on the machine’s touch screen control. Tool positions are automatically calculated as a part of the programme and flashing LEDs on the front of the upper beam instruct the operator where the tools need to be mounted to correspond with the 3D movements of the high speed backgauge. The ByVision touch-screen control, which is mounted directly in front of the operator, displays simple 3D graphics of the bending process. An optional bar code reader allows the programme to be called from a bar code on a work sheet or from a QR code etched on the blank should the owner have a Bystronic laser cutting machine.